Symptoms of a brain aneurysm (1) are typically obvious and won’t be silent. It’s usually described as the worst headache of your life. For those who regularly suffer from migraines and bad headaches, determining what’s considered the worst headache can be tricky, but even so, it’s important to pay attention to your symptoms—and don’t downplay what you’re experiencing. There’s no harm in seeking immediate medical attention if a sudden, horrific headache comes on. If it turns out to be an aneurysm, it’s better to catch it before it ruptures. In 40% of ruptured brain aneurysm cases the outcome is fatal, and four out of seven people who survive the rupture will have lifelong disabilities to overcome and manage. A brain aneurysm (2) happens when a weak spot in an arterial wall fills with blood and swells up as a result. It’s also referred to as an intracranial (skull) aneurysm or a cerebral (brain) aneurysm (3). They occur most commonly in arteries found at the base of the brain. Most are small, about an eighth of an inch to one inch in size. If an aneurysm is larger than an inch, it’s called a “giant” aneurysm and can be difficult to treat. A brain aneurysm can be a life-threatening condition and can happen to anyone, and if it erupts, it’s a medical emergency. If not treated right away, a burst aneurysm can have devastating results, including stroke, brain damage, and death. Therefore, knowing which aneurysm signs and aneurysm symptoms to look out for could save a life. One of the first signs of a ruptured or dormant brain aneurysm is a headache, and a really bad one at that. 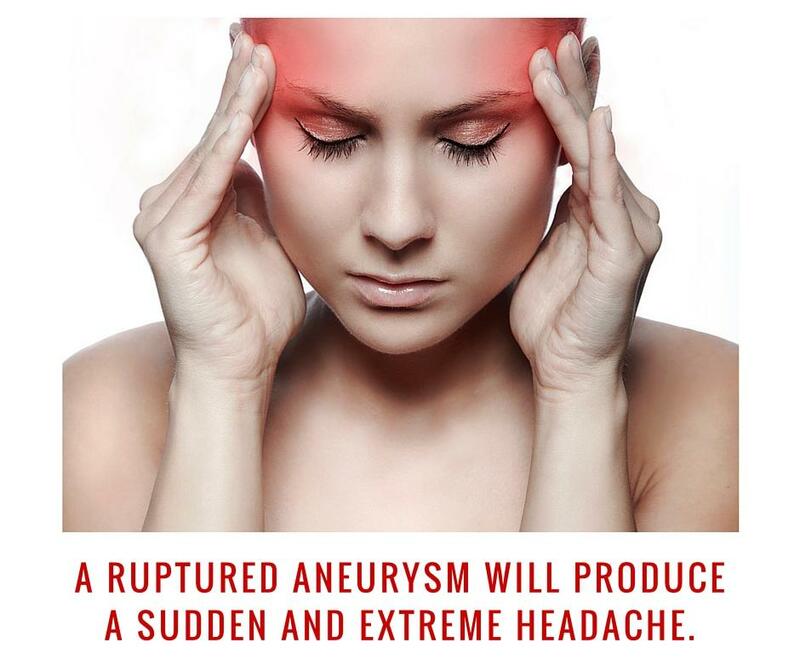 A ruptured aneurysm will produce a sudden and extreme headache, and if this happens you must seek medical attention immediately, particularly if it’s associated with other signs, including a stiff neck, vomiting, seizures, and drooping eyelids (one or both). Get yourself to the emergency room if any of these signs develop. 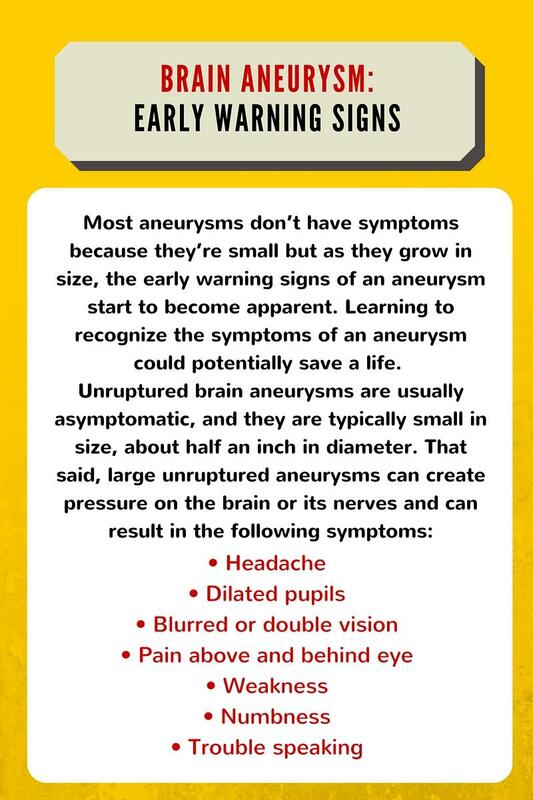 When an aneurysm is developing but is small or medium in size, it will cause headaches along with dizziness, eye pain, blurry vision, and even seizures. If you have a headache that is persisting for days and even weeks, along with these other symptoms and or others, see a doctor right away so tests can be done to determine if there is an aneurysm. Surgery is intense and risky and recovery can be long and involved when a brain aneurysm ruptures, so it’s better to seek help before any of this becomes a reality. Prevention is possible if it’s caught in time. Brain aneurysms happen in adults more than they do in children, and occur in more women than men; they typically start to appear after age 40. There are several risk factors to be aware of; most of them develop over time, but some are present at birth. According to the Brain Aneurysm Foundation, 1 in 50 people (6 million) in the United States have unruptured brain aneurysms (4), 10 to 15% of those have more than one aneurysm, and an aneurysm ruptures every 18 minutes. The following health issues that are present at birth can make some people more prone to developing a brain aneurysm. Most aneurysms don’t have symptoms because they’re small but as they grow in size, the early warning signs of an aneurysm start to become apparent. Learning to recognize the symptoms of an aneurysm could potentially save a life. If you have some or all of the symptoms listed above, you might be experiencing a brain aneurysm. See a doctor to be thoroughly evaluated. Why Does an Aneurysm Bring on a Sudden Headache and Other Symptoms? Recognizing the symptoms of a brain bleed can save your life, but if a rupture does occur, surgery is likely the next and most immediate step. Once an aneurysm ruptures and blood gets inside the spaces of the skull, the damage is irreversible; all that can be done at that point is to try to limit further damage. Managing an unruptured brain aneurysm involves observation and treatment, and this is determined by your doctor based on your age and health, the size and location of the aneurysm, and the presence of other aneurysms. In order to correct an aneurysm, surgery is required but doctors don’t jump to this approach as fast as they used to because other treatment options are available. It is brain surgery, after all, and it cannot be taken lightly. The procedure is risky and the road to recovery is long, but if your doctor and surgeon have determined that it’s the best course of treatment for you, the risks of not doing it likely exceed the risks of doing it, especially considering the awful potential outcomes if the aneurysm ruptures. Still, for peace of mind, seek second and third opinions if you’re unsure. One common procedure done for an aneurysm is clipping. During this procedure, an incision is made into the scalp and a small hole is made in the skull. A small metal clip is then placed at the base of the aneurysm to prevent it from any further rupturing. The skull is then closed up and the scalp stitched. Large scars can often result from this surgery, and you’ll likely have to shave your head so the surgeon can operate. The rate of recovery from a brain aneurysm is difficult to predict because each case is unique. Watching for brain aneurysm symptoms and catching the condition early can make a big difference in the outcome. Those who undergo surgery for an unruptured brain aneurysm typically recover faster and need less rehabilitation than those who had surgery for a ruptured aneurysm. The good news is that the brain is an incredible organ which can re-learn information and skills which may have been lost. Recovery is possible in time, but a positive outlook is an important element to that process.